The walled city of Gubbio is sited at the foot of Mount Ingino in Umbria, central Italy. 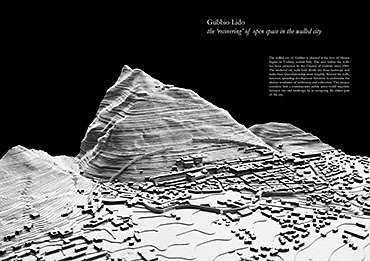 The ancient city developed in tension between topographic and cosmological approaches: the axes of the Roman ‘templum’ were adapted to the terrain, oriented to the archaic dialogue between mountain and plain. 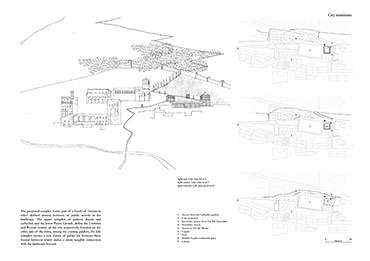 The’ idea’ of the town was always in tension with the terrain: the medieval city walls both divide city from landscape and make their interrelationship more tangible. 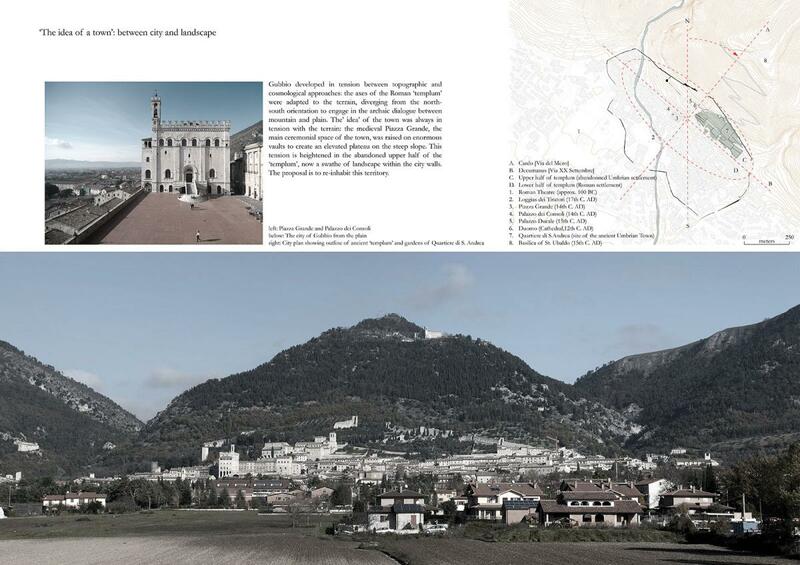 The area within the walls has been protected by the Charter of Gubbio since 1960. Beyond the walls, however, sprawling development threatens to undermine the distinct territories of settlement and cultivation. 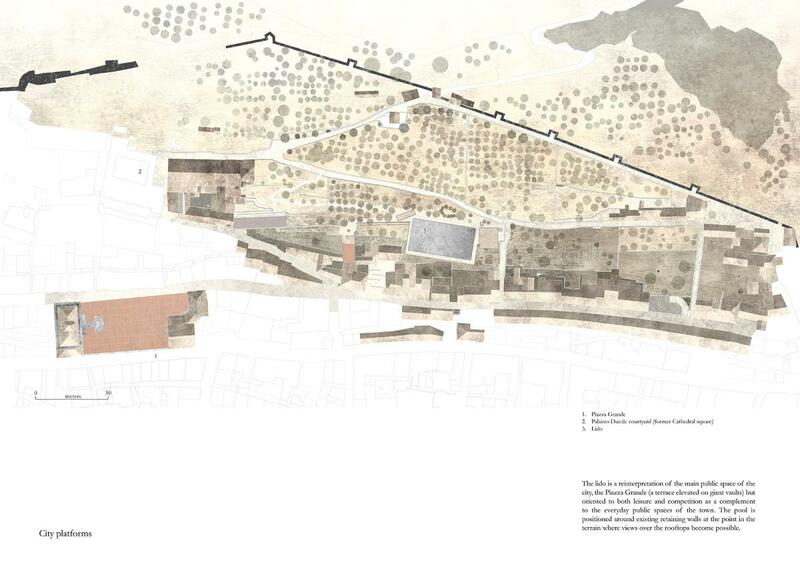 This project considers how a contemporary public space could negotiate between city and landscape by re-occupying the oldest part of the city. 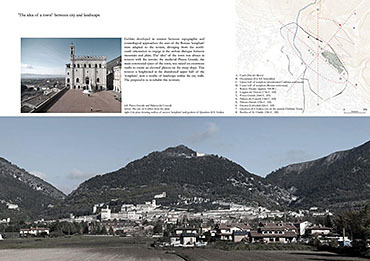 The site, Quartiere di S.Andrea, is thought to have been part of the first Umbrian settlement, subsequently abandoned as commerce moved to the plain below. 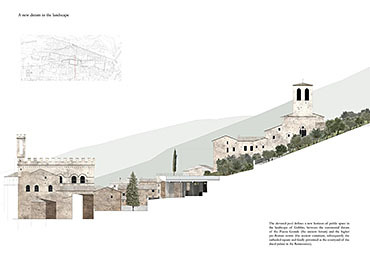 Its olive groves are largely inaccessible – though visible - to the public. 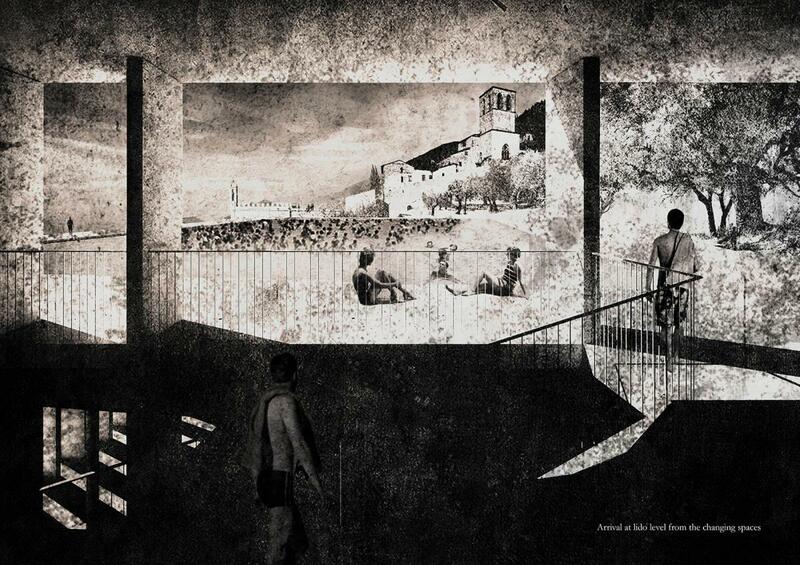 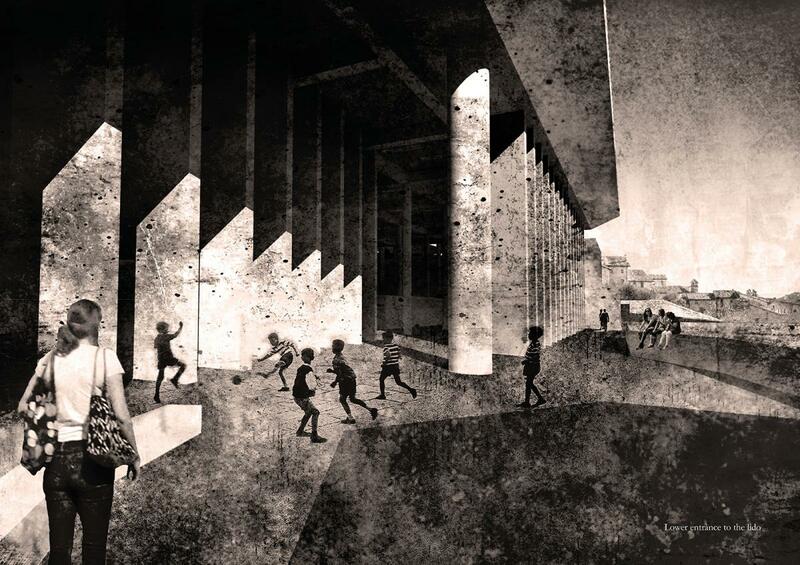 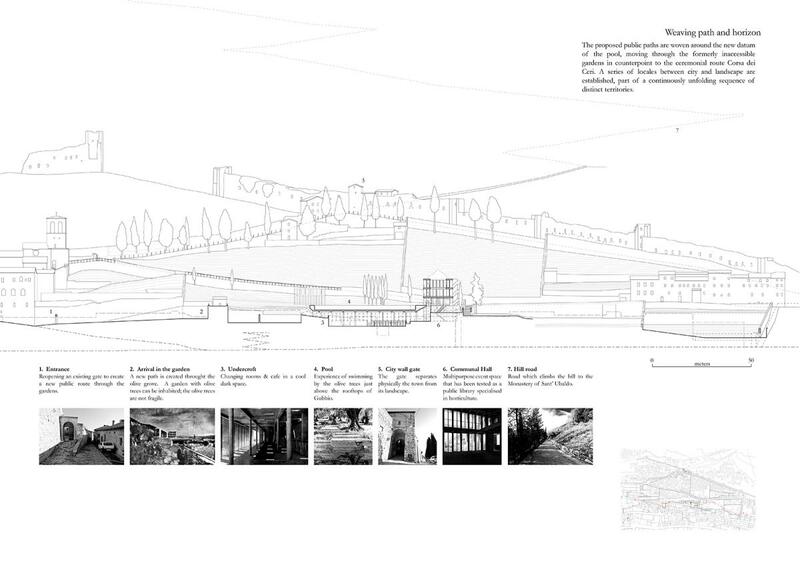 The project for a new public space is intended both to protect and make more accessible this unusual landscape within the walls through selective development. 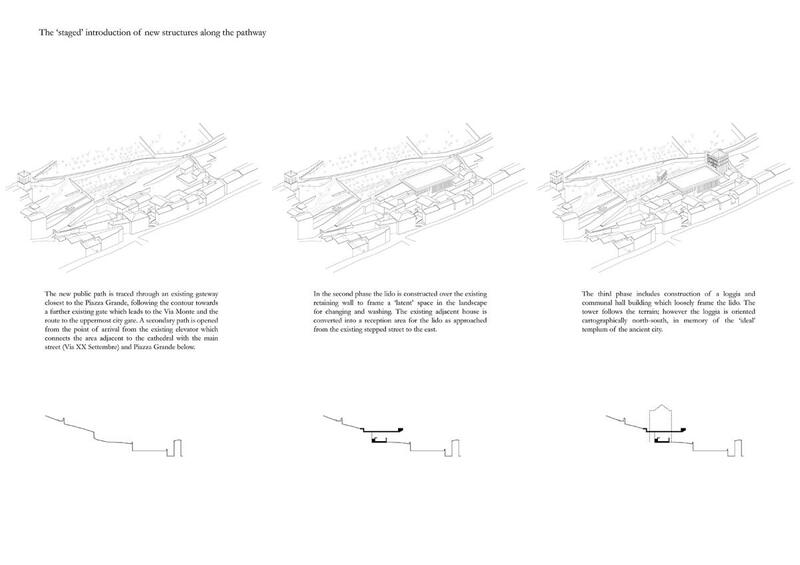 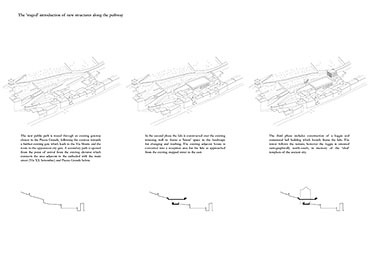 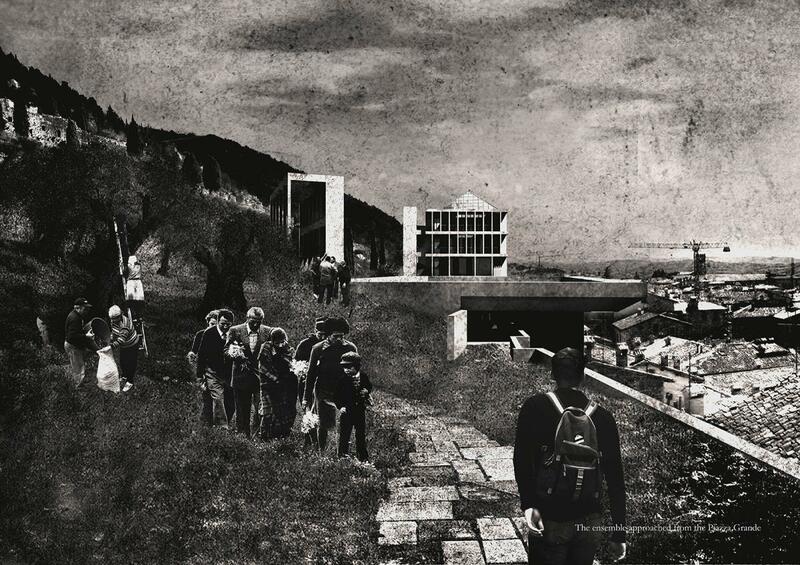 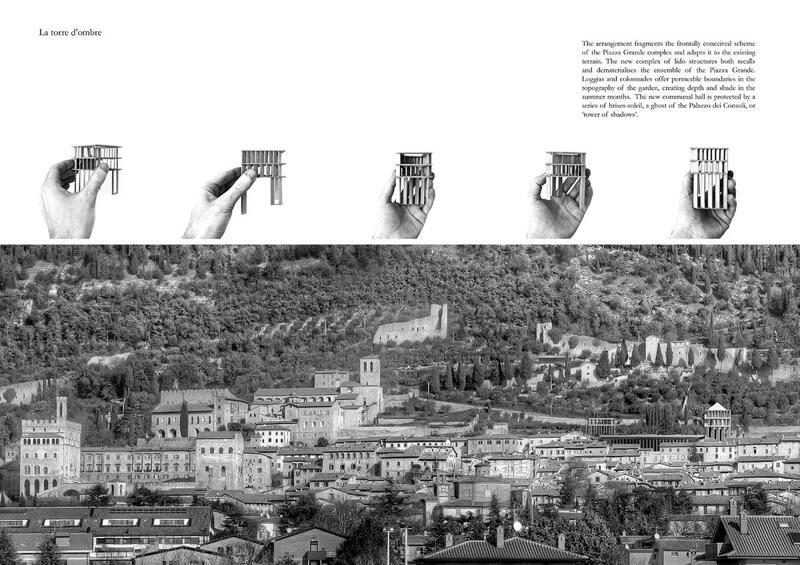 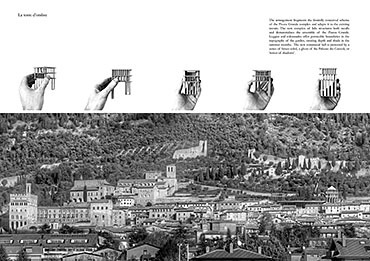 A public route is introduced through the gardens, from town to landscape, integrating the site into the life of Gubbio and creating a series of territories which unfold through movement. Along the way a lido, structured as a large horizontal tray, defines a new horizon in the landscape between the ceremonial datum of the Piazza Grande and the higher pre-Roman centre. 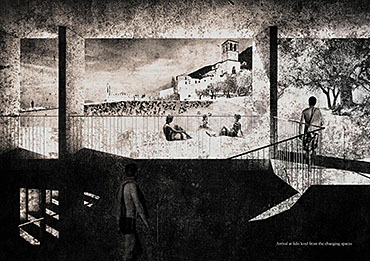 Raised over existing terracing to form cavernous spaces for washing and changing, the lido is a reinterpretation of the main public space of the city, the Piazza Grande (a terrace elevated on giant vaults) and is oriented to both leisure and competition as a complement to the everyday public spaces of the town. 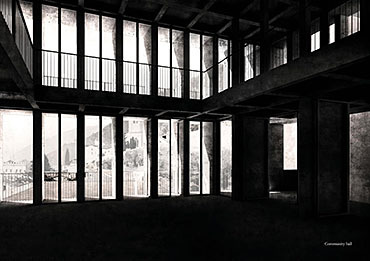 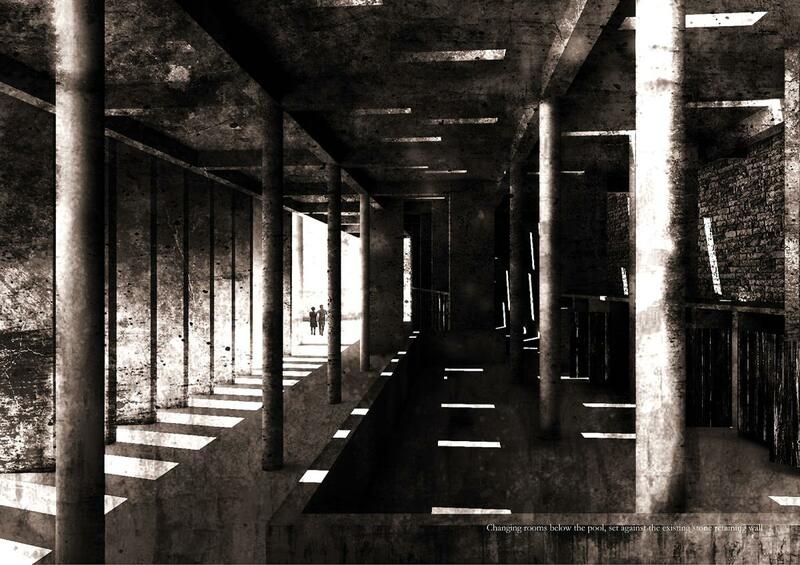 The adjacent structures dematerialise the public buildings which frame the Piazza Grande, the new communal hall acting as a ‘tower of shadows’. 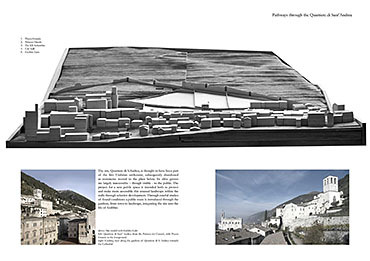 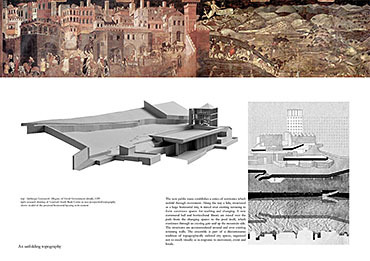 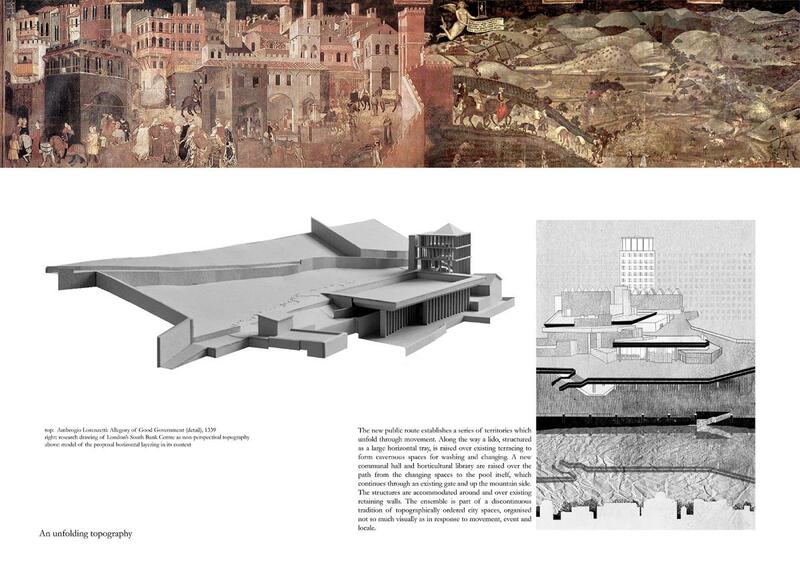 The arrangement fragments the idea of the Piazza Grande complex and adapts it to the existing terrain, creating a continuously unfolding topography.